This article is about the disease in general. For information about the medieval European plague, see Black Death. The bubonic plague is an infection of the lymphatic system, usually resulting from the bite of an infected flea. The fleas are often found on rodents, such as rats, and seek out other prey when their rodent hosts die. Once established, bacteria rapidly spread to the lymph nodes and multiply. Yersinia pestis can resist phagocytosis and even reproduce inside phagocytes and kill them. As the disease progresses, the lymph nodes can hemorrhage and become necrotic. Bubonic plague can progress to lethal septicemic plague in some cases. The deadly disease has claimed nearly 200 million lives. The first recorded epidemic ravished the Byzantine Empire during the sixth century, and was named the Plague of Justinian after the emperor, who was infected but survived. The most infamous and devastating instance of the plague was the Black Death, which killed a third of the population of Europe. The Black Death is thought to have originated in the Gobi Desert. Carried by the fleas on rats, it spread along trade routes and reached the Crimea in 1346. In 1347 it spread to Constantinople and then Alexandria, killing thousands every day, and soon arrived in Western Europe. In modern times, several classes of antibiotics are effective in treating bubonic plague. These include the aminoglycosides streptomycin and gentamicin, the tetracyclines tetracycline and doxycycline and the fluoroquinolone ciprofloxacin. Patients with plague in the modern era usually recover completely and with prompt diagnosis, and treatment, although the disease is rarely seen in the industrialized world. Can you still get the plague today? So yes. Pet Rats are safe, fun, trainable and even lovable and affectionate to have around. Pet Fancy Rats are less likely to bite then a hamster, more affectionate then a gerbil (or many other pets), cleaner then a guinea pig, do not need shots and registering like a dog, cat or ferret, and do not smell like mice tend to. 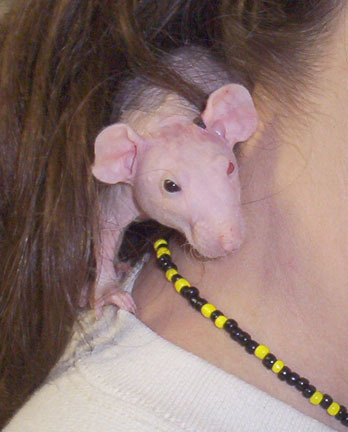 A rat will ride on your shoulder for hours like a parrot or monkey and can be "potty trained" as well as other training like to do tricks and tasks and agility and to come when you call it's mane.